Ever since a cask of Dewar’s Old Highland was sent to President Benjamin Harrison in 1891, whisky has had a place of privilege in the White House. As the latest election looms, Iain Russell charts the ‘special relationship’ between Scotch and the Presidency. George Washington was famously persuaded by his farm manager, Scotsman James Anderson, to build a distillery on his Mount Vernon estate in 1797. The first President of the United States (1789-97) made a spirit that we would identify today as American whiskey, using locally-grown barley, corn and rye. While none of his successors followed him into the distilling business, many became enthusiastic spirits drinkers – and Scotch took pride of place in several presidential drinks cabinets. The first delivery of Scotch to the White House was apparently unsolicited. In 1891, the Scots-born industrialist Andrew Carnegie asked John Dewar & Sons to send a cask of Old Highland Whisky as a gift to President Benjamin Harrison (1889-93). Meanwhile, temperance campaigners fulminated against the presence of any sort of hard liquor in the White House. The story stimulated a surge in American popular interest in Dewar’s brands, and in Scotch whisky in general. The rise of Scotch in the US was challenged by the introduction of Prohibition there in 1919. Woodrow Wilson was the President (1913-21) who tried, but failed, to veto the Volstead Act in 1919, believing that Prohibition would be unenforceable. Wilson was not a heavy drinker, but enjoyed a Scotch and soda. In 1921, a cask of Scotch whisky was included in the stock of liquor removed under permit to his new home in Washington DC after he left the White House. Wilson was succeeded by Warren Harding (1921-23), who presided, knowingly or not, over a spectacularly corrupt government. 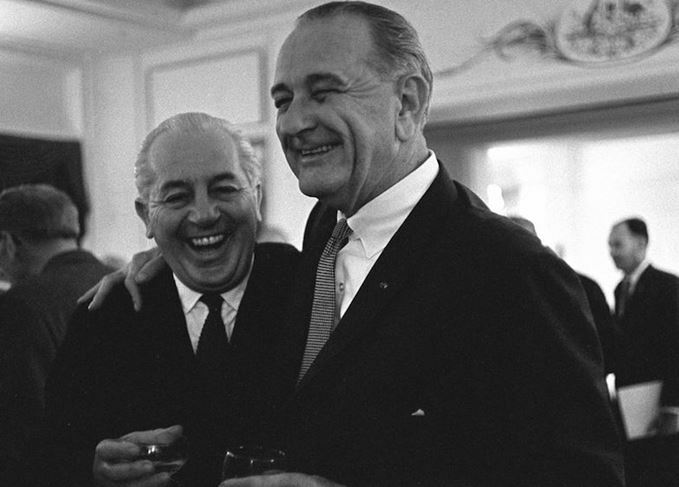 Harding enjoyed drinking whisky while playing golf or a game of poker with his political cronies and, according to Daniel Okrent, a chronicler of Prohibition, his manservant ensured that his private house in Washington was well-stocked with illicit Scotch and Bourbon. Harding also received supplies from Harry Daugherty, his corrupt Attorney General, who had access to the choicest liquors seized by law enforcement agencies. Like thousands of American servicemen, Supreme Allied Commander and then President (1953-61) Dwight D Eisenhower had become a Scotch aficionado while serving in Europe during the Second World War. Like so many others, he preferred his whisky with soda. The political career of President John F Kennedy (1961-63) is said to have been financed in large part by profits made by his father Joe, importing Scotch to the US after Prohibition. But JFK himself was not known as a Scotch drinker – unlike his successor, Lyndon B Johnson (1963-69). ‘In the early afternoon, the President, with me next to him in the front seat, took his white Lincoln convertible, top down, for a drive around the ranch. It was incredibly hot; the dust clouds made it hard to breathe. But there was relief. ‘As we drove around, we were followed by a car and a station wagon with Secret Service agents. The President drank Cutty Sark Scotch and soda out of a large white plastic foam cup. ‘Periodically, Johnson would slow down and hold his left arm outside the car, shaking the cup and ice. A Secret Service agent would run up to the car, take the cup and go back to the station wagon. There another agent would refill it with ice, Scotch and soda as the first agent trotted behind the wagon. No American President since Johnson has been noted particularly as a Scotch aficionado, but Ronald Reagan did briefly hit the whisky headlines. In 1991, he was invited to address the Keepers of the Quaich, and to be ‘Keepered’ himself, as part of the celebrations of the 500th anniversary of the whisky industry. The President had been blissfully unaware until then of his family’s links with the whisky smuggling trade in 19th-century Scotland: genealogists discovered that he was the first cousin, four times removed, of one of the last illicit distillers to operate a still in Kintyre. The relative’s name, unlikely as it may seem, was… Johnnie Blue. Intriguingly, the imminent Presidential election throws up the possibility of a new and unique link between the White House and Scotch whisky. Donald Trump famously boycotted Glenfiddich over a perceived slight (the Glenfiddich-sponsored Top Scot award went to one of his critics in Scotland in 2012). But The Donald has his own single malt whisky for sale at his Trump International Golf Links in Scotland – a 26-year-old single malt from GlenDronach Distillery in Aberdeenshire. Other bottlings seem certain to follow. Is there any chance that the outspokenly-teetotal Trump might just become the latest Scotch whisky-loving President of the USA? The ‘Whisky Baron’ overcame ill-health to create some of Scotch’s most successful blends.